Entries accepted Saturday, Nov. 23. Event held at Brown County Inn, intersection of SR46 and 135. See website, createitwithgingerbread.com for rules. 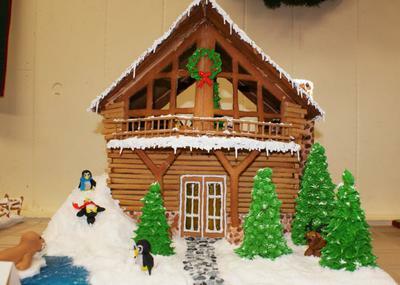 2015 has been a banner year for finding sponsors for the 6th Annual Gingerbread Log Cabin Competition. Building a gingerbread structure with gingerbread logs is a challenge. The goal of the Create it with Gingerbread Club aka Ginger Girls is to promote creativity in design, structure and decorative ideas. The sponsors are willing to promote the Clubs ideas by offering a Best of Show Award of $1000.00. Might not seem like much to some folks but for a small village of 800 happy souls, that amount is impressive. the 2014 gingerbread house auction will benefit Mother's Cupboard food pantry in Bean Blossom IN. see web site for full list of awards. This is fun event and smells great. Radio personality Terri Stacy, WIBC, Indy will be interviewing competitors entry day, Nov 22, noon to 1 pm. Come join the fun at the Brown County Inn in beautiful, quaint Nashville IN.